Traditional customer experience design or user experience design is evolving into creating an experience for an integrated environment to make most of the advances in the technology world. The boundaries between physical and digital worlds are merging and additional channels to interact with the devices via voice and gestures are allowing the creative minds to transcend the boundaries of traditional customer experience. Home automation devices such as Nest, Eccobee are classic examples of how we have evolved to control the physical world thru the Digital channel. Connected cars allowing you to do commerce, smart walls detecting vitals in a human body, Amazon Go stores where you can do cashless shopping are few other examples of this nascent yet exciting world. We are seeing just the beginning of this new world and it’s important to keep certain principles in mind while innovating and creating new products/services in the Integrated Customer Experience world. The innovation should not be based on the technology-focused thinking but rather should be based on customer use case focused thinking. Technology focused thinking will create a solution/product the customers do not want and will waste precious resources during the product/service lifecycle. It’s very important to create cheaper prototypes, paper-based experiments, and digital mock-ups to interact with the customers to receive the feedback early on your new idea to establish/refine the feasibility of the innovation. What is the value proposition you are offering and what business model will you create around it. These 3 foundational elements are critical for the success of your innovation and experiments. By adopting an agile methodology to iterate thru the experiments and going back to the drawing board is an effective way to ensure success of your innovation. It’s also very critical to define the metrics on measuring the results from the experiments which will directly establish the validity of your value proposition. While the innovation may be based on addressing an existing problem the solution thinking should be always futuristic anticipating the future state of that domain or experience. This is where the creative minds excel by crossing the boundaries of current state and also thinking across multiple domains/industries to derive corollaries. Creating a team of people from different backgrounds, skills, industries will also help the in the divergent thought process. Technology is a great enabler to solve business problems or to foster innovation and needs to be carefully evaluated. Selecting a wrong technology can lead to diminished returns or will necessitate the need to reengineer in near future. Creating proof of concepts to prove the technology is an effective way to ensure success of-engineer adoption. With a creative and experienced team, you can offer an elevated value proposition to your customers by creating an Integrated customer experience. Think about your customer sitting in his/her living room and experiencing an in-store walking/shopping experience leveraging Augmented reality and collaborative commerce. There are unlimited possibilities of what all applications/products will evolve leveraging integrated customer experience and how the customer will benefit from this evolution. Know more on how Innovecture team has designed an Integrated Customer Experience. SimPayX is Innovecture’s product and solution that is a single-app which operates efficiently on attended or unattended platforms. 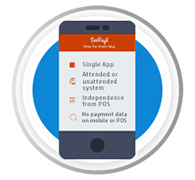 It is an independent POS with no payment data on mobile or POS required, keeping the transactions smooth and safe.